Higher Nature - Organic Flax Seed Oil (60 capsule)Unrefined, Flax Seed Oil is rich in the Omega 3 essential fatty acid (EFA), alpha-linolenic acid typically 50-65%. It is also a good source of Omega 6 and Omega 9, and contains mixed tocopherols (especially gamma tocopherol) and tocotrienols. Omega 3 and 6 support a healthy heart, arteries and brain. Fatty acids make up the walls of every cell in the body and make hormone-like substances, important for many essential body processes. Unrefined, Flax Seed Oil rich in Omega 3 typically 50-65% Also a good source of Omegas 6 and 9 Fatty acids make up the cell walls and are essential for many body processes Easy to swallow, soft gelatine capsules Ideal for travelling Please note actual image may vary.Information on this site is not intended to diagnose or treat any health condition. We recommend that if you are pregnant, nursing, have a medical condition or are currently taking medication that you seek advice from a health professional before you take any dietary supplement. Always read the product directions before use and do not exceed the recommended intake. Food Supplements should not be taken as an alternative to a balanced diet. Keep out of reach of children. 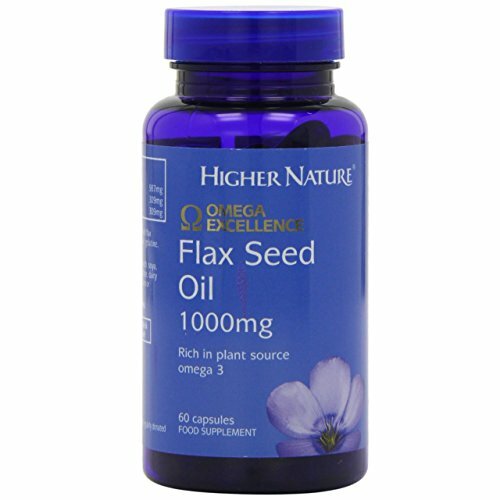 Great Deals & Offers On Higher Nature - Organic Flax Seed Oil - 60 capsule . FREE Delivery On ALL Items. If you have any questions about this product by Higher Nature, contact us by completing and submitting the form below. If you are looking for a specif part number, please include it with your message.